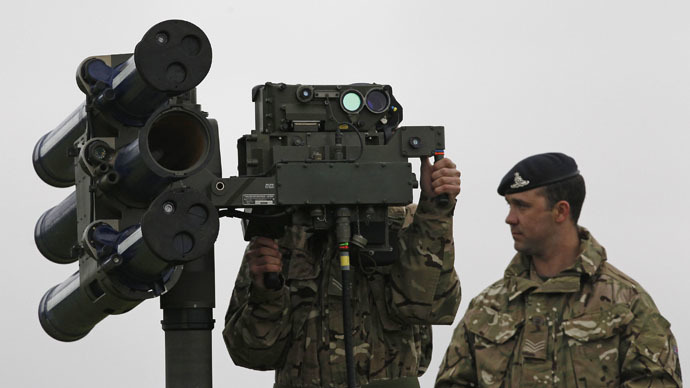 The government believes strategic threats posed to Britain are not serious enough to merit insulating military spending from budget cuts, according to a report by a top defense think-tank. The paper by the Royal United Services Institute (RUSI) centers on the economics of defense under austerity. The findings jar with recent statements by politicians and leading generals on the dangers faced by the UK. The investigation also indicates Britain is unlikely to meet the symbolic spending of 2 percent of GDP on defense, expected by NATO in coming years, and that thousands of soldiers could be cut irrespective of who wins the general election this year. It warns that up to 30,000 service personnel could be axed. Given the Royal Navy may be largely exempt from redundancies, to ensure it can crew Britain’s aircraft carriers, the army could be forced to handle 80 percent of the intended reductions. The report comes at a difficult time for David Cameron who this week faces a rebellion by a number of Tory MP’s over defense cuts. Last week Bob Stewart, an army colonel turned Tory MP, argued defense is in a “parlous state” and that service chiefs should resign over cuts. He suggested he might step down himself, either as an MP or from the influential Defence Select Committee. UK allies are also worried. General Raymond Odierno, chief of staff of the US Army, recently told the Telegraph he was “very concerned” at the cuts being made to the UK’s armed forces.